While active NFL players are not allowed to use marijuana as a form of medical treatment, former players are free to treat their aches and pains with the plant where it’s legal, and more and more are beginning to do so. 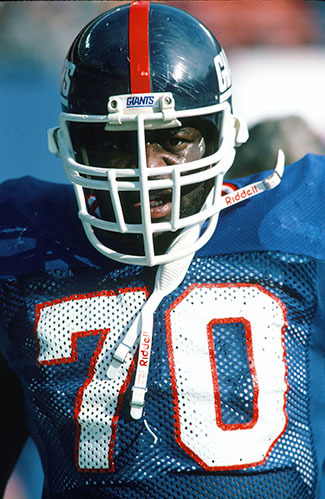 Two-time Pro Bowler Leonard Marshall recently joined the campaign for medical marijuana use for pain management among athletes. Marshall, a former defensive end who spent 10 of his 12 seasons with the Giants, uses a hemp oil product derived from the marijuana plant to treat symptoms he believes is related to head trauma suffered during his playing career. But he’s not in it for the high. The hemp oil is a Cannabidiol (CBD) which doesn’t contain the second main ingredient in marijuana, THC, the component that floats you off to your happy place. In 2014, Marshall, now 54, was part of the first study that set out to diagnose signs of chronic traumatic encephalopathy in living people; he was diagnosed to have signs of CTE. Since then, he has tried many different medications but says that CBD products have given him the most relief from the headaches and mood swings that regularly interrupt his daily life. Though for Marshall, it’s more than just an effective remedy; the self-described “serial entrepreneur” knows a lucrative business opportunity when he sees one. Marshall spoke to The MMQB about how eight droplets of oil each day have changed his life. KAHLER: When did you first try CBD as a form of treatment for your symptoms? MARSHALL: I started exploring with hemp oil around February. I don’t smoke. I have tried, but I don’t smoke, because I’m not using the inducement of a THC high to help me with my problems. I realize that if I wanted the euphoric feeling and the relief from pain, that would be the option that I would take, primarily because opioids for a time have killed more Americans than any other plant I have ever seen in my life. You can’t tell me that pot or the smoking of pot is as bad as an opioid or has killed as many Americans as opioids. Opioids are made by man, pot is made from soil, it is a seed that gets planted. It has made me take a different look at the approach to dealing with pain than I used to. KAHLER: How do you feel the hemp oil helps you? MARSHALL: I swallow four droplets in the morning and four droplets at night. It helps with headaches, it helps to calm me down, it helps with mood swings and depression. I’m using a hemp oil product right now, and it is the best stuff that I have come across. I am not kidding you, it has done me right. I also have a vapor pen, and that helps. KAHLER: When you first tried it, did you notice immediately that it you felt better? MARSHALL: I noticed after a few hours, I felt a bit better because I didn’t have the headaches. That’s the main thing. I don’t know how the hemp does it, but whatever it does when it gets into your bloodstream, it allows your blood to flow and you get more oxygen into the brain and that’s the reason why you don’t have the headaches. Right now, I’ve got a vapor pen in my hand and I’m sucking on CBD right now as I am driving. The vapor is the same as the oil I use, but instead, I am breathing it in and it is actually going up to the brain, it actually helps to flow blood to my brain. It’s kind of hard to describe unless you are really there. • TRENT DILFER IS STAYING AT ESPN: Talking Football with the former QB, who despite rumors of a departure signed a multi-year extension with the network. KAHLER: You were the keynote speaker at the Cannabis World Congress and Business Expo last week in New York City. How did you get involved with the industry side of it? MARSHALL: I have a friend who owns a company that is an exposition company, called MyExpo. They are based in New Jersey and they do franchise expos all across the country and the world. His sister contacted me because she became a partner in an expo that promotes the use of cannabinoids. Because of my situation with [the CTE symptom study], she asked me if I would I be interested in being the keynote speaker and exploring the use of cannabinoids. She also said I’d have the opportunity to endorse a few companies and their products along the way. I am a serial entrepreneur. I love the creation of idea to product, product to market, and market to saturation. I love new ways of thinking and new ideologies associated with certain issues that we face as Americans. So I opened myself up to this idea and decided to be the keynote speaker. I was paid a hefty sum of money to do so and as a result of it, connected with a lot of companies and helped brand the idea of the use of cannabinoids to help ex-pro, collegiate, recreational athletes and those aspiring to play professional sports with the use of products associated with marijuana to help them with traumatic brain injury and the impairment that is caused. ​KAHLER: So you originally got behind the use of cannabinoids because it was pitched to you as business venture? MARSHALL: Yes, I dove into it, I learned a lot. I’ve been a quick study for the last six months. This conversation started in February and came of age in June and this was the first time I spoke about it publicly. I’ve become extremely knowledgeable in terms of the use of products, especially hemp oil and the difference between hemp oil and the products that are infused with THC, which is the component that gets you high for marijuana usage. When I first took this on, I had an idea that Cannabis World Congress and Business Expo was a professional association, but I didn’t have an idea that there was that much money tied to this industry, and man was I wrong! KAHLER: Do you have plans to do any business in the industry? MARSHALL: I’ve been listening to Gary Johnson speak, and I know he is representing the libertarian party in this election, but I have to tell you that his company, Cannabis Sativa Inc, is one that is on my radar as one to track and follow. I am actually about to get involved in a company that I met at the show, I won’t say their name until I am actually inked and on paper, but they are heavy in this space and they do a little bit of both. They work with THC as well as cannabinoids. I think it’s a unique opportunity, and I think they are going to help a lot of people and change the world. KAHLER: Have you spoken with any former teammates about CBD? MARSHALL: There’s been talk that my teammate Harry Carson has signs of CTE, there’s been talk that several other guys have signs of CTE. I don’t know these men and their situations that well, because the communication is not what it used to be when we were in the locker room together. Hopefully those guys who do use them will speak, like Jim McMahon, like Charlie Adams, like my buddy Nate Jones, like several of these guys who were at the conference. I think it is important that you not only find a means to a solution but that you pay it forward, and that you show people that there are options out there. There are ways to deal with this. KAHLER: When you were a player, did you ever have any bad experiences with the opioid-based painkillers? MARSHALL: I wasn’t using a lot of pain pills when I played. I didn’t have too many situations where I needed them. I had probably five or six injuries that were pretty serious, two in particular that were very painful. I broke my forearm in December of ’93 with the New York Jets and I broke my wrist in November or December of 1987. Those were two situations where I was in severe pain and I went on the pain meds. But once I was done, I was done. I took Percocet, Indocin, and Naprosyn. I had an ankle sprain, tweaks in my knee, torn meniscus and a real severe thigh bruise one time, so with those injuries I took what they gave me for medication and when it was done, it was done. Once I was healthy, I never looked at the drugs again. I wasn’t the type of guy to do that, I wasn’t in a position to get hooked on the stuff. I had a lot of discipline during that time because I knew that if I got involved in it, it would threaten my ability to earn money. I loved what I did as a player, and I loved to earn money, so it was important to me to be healthy enough and take good care of my body so that I could do those things to take care of myself and my family. That was important to me. I didn’t take football for granted. • CAMPUS LIFE WITH JIM HARBAUGH: Why the outspoken Michigan coach is loving life in college. Plus, notes on the Kirk Cousins negotiations, new-found depth in Detroit and a new left tackle in Seattle. KAHLER: Did you smoke marijuana when you were a player? Was it recreational then or for medical relief? MARSHALL: No, that was in college, that was long before I was a pro. When you are kid you try to experience a lot of stuff. The one thing I knew when I went pro, and I go back to this, I knew it threatened my ability to earn money. I wasn’t going to do anything to mess with that. KAHLER: Was anyone using marijuana for medical purposes then? MARSHALL: No, it wasn’t happening back then, because it wasn’t an approved substance. So if a guy was using it, he was using it illegally, and most of the time he got caught. If he got caught, Bill Parcells gave him an ultimatum: It was either marijuana, or the NFL. Which one do you want? For me, it was a no brainer. For some guys, it wasn’t a no-brainer. They continued to live their lives the way they were living. The NFL doesn’t condone that and I knew that, and the real smart player knew that. KAHLER: Do you think the NFL should remove marijuana from its banned substances? MARSHALL: They are going to have to do something. I’m not going to suggest removing marijuana entirely because then it will turn into a mess, but I think they are going to have to increase the amount of nanograms that allows a player to pass a drug test. They need to increase it so that for medicinal reasons, a player can inhale a certain amount and not fail a test. Now, I don’t know how much that amount is, but from what I understand, there are tests being done to do exactly what I am talking about, find a new test limit. Hopefully they will find a happy medium to help these young guys that are trying to continue to grow. I think that CBD, because it is a non-THC component that is derived from marijuana, will definitely play into the hands of the NFL and its players. I think it will also help with the NBA, the NHL and MLB over time. KAHLER: Eugene Monroe, the left tackle recently released from Ravens, was the first active player to advocate for cannabinoids as pain management for players. Have you talked Monroe at all about his stance? MARSHALL: No, I haven’t. But he’s very outspoken about this and a great guy and a true ambassador in the NFL for an advocate for the use of marijuana amongst NFL players. I respect that. Like I said before, I have never seen marijuana kill anybody, I’ve seen opioids kill people, I’ve seen opioids induce people to kill people, but I’ve never seen marijuana do that. KAHLER: Do you think he’s taking a big risk by speaking out for medical marijuana use among players? MARSHALL: We’ve seen that it already has been a risk, he’s been released by the Ravens. KAHLER: Do you think other teams might be hesitant to sign him because of that? MARSHALL: Yes, no doubt. I mean that’s the way things are. Are you part of the solution or are you part of the problem? This is a clear case where if you are a guy who is attempting to fight the establishment, you will be made the odd man out. • STILL SQUEEZING THE JUICE: NFL Network’s Rich Eisen had two recent guests on his show to talk about why O.J.’s story still resonates so strongly today. KAHLER: On the field, your former team spent big this offseason on free agent acquisitions Snacks Harrison, Olivier Vernon and Janoris Jenkins. Do you think these guys will be able to save a Giants defense that finished as the league’s worst unit last season? MARSHALL: It has yet to be seen how they will improve that defensive line, but I’ll tell you what, they did spend a lot of money. Snacks is from Louisiana, the same area of Louisiana where I grew up, so I am hoping that becomes some sort of motivation for him to play up to a certain level and have quarterback pressure production that is a lot better than it was with the New York Jets. You hope they are up for the challenge, from what I understand, nearly $200 million got spent on these three guys on defense. It looks great on paper, but when it comes to playing, they don’t perform. Will the Giants be the same old mess, the same old team? I am going to go training camp this year and watch that interior line work a little bit and see how things progress. KAHLER: I know you’re also an advocate for making the game safer and practices safer. In an effort to eliminate injuries, the NFL changed the rule to place touchbacks at the 25-yard line. Do you think the kickoff will even exist in 10 years? MARSHALL: It’s tough to say, because I see the kickoff being eliminated, but it takes the competitiveness out of the game, because you can win or lose the game on a kickoff. I hope that the underdog will still have a chance and they continue to have the kickoff, otherwise the competitive nature of the sport is going to diminish. Just like I’ve seen the game change from when I played. People tell me all the time, Michael Strahan had a lot of quarterback sacks. I say, yeah, Michael Strahan played in a league where they threw the ball 70 percent of the time and they ran the ball 10 percent of the time, and then the rest of the time they were running screen plays. During the time that I played with Lawrence Taylor, they threw the ball 40 percent of the time, ran the ball 40 percent of the time and 20 percent of the time they ran screen plays. It was extremely balanced back in the day. It’s a lot different ball game now 25, 30 years later than it was back during my era.